Larne swimmers Danielle Hill and Conor Ferguson set Irish senior 50m backstroke records on day one of the Dave McCullagh Memorial meet at Bangor. Hill achieved her first national senior mark as her winning time of 29.15 seconds cut 0.25 seconds off Aisling Cooney's 2011 mark. Ferguson cut 0.06 off Karl Burdis' 2009 Irish mark as he was second in 25.34 behind Shane Ryan (24.94). Bethany Firth won the women's 100m free in a new personal best of 56.58. Firth is using the Bangor event as part of her preparations for her Paralympics challenge with the British team in Rio later this year. 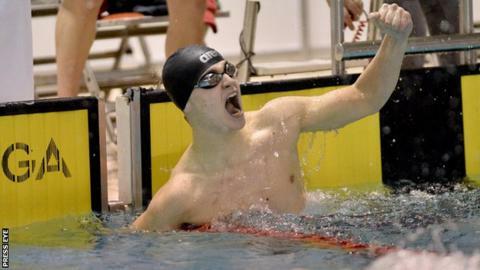 Former US team member Ryan, 22, is set to become Irish qualified in May as he aims to secure a spot at the Olympics. Ryan won the 100m freestyle in 50.14 on Friday with Bangor youngster Jordan Sloan taking third in 50.80. Ryan will be in action in the 100m backstroke with Ferguson at the Swim Ulster international meeting on Saturday. Donegal youngster Mona McSharry achieved the European Senior Championship qualifying standard as she broke Sycerika McMahon's 2011 Irish junior breaststroke record by 0.17 by triumphing in 1:09.07. In the same race, Niamh Coyne took bronze in 1:10.96 to secure qualification for this year's European Junior Championships. In the men's 100m breaststroke, Alex Murphy booked his spot at the European Championships with the personal best of 1:01.01 as he finished 0.03 behind Commonwealth Games gold medallist Ross Murdock.